Super Trio Maximus <超級無敵獎門人 終極篇>, the tenth series to TVB’s Super Hero game show, began filming its first episode this week. Hosted by Eric Tsang (曾志偉), Super Trio Maximus will bring together all of his co-hosts from previous series, which include Jordan Chan (陳小春), Chin Ka Lok (錢嘉樂), Jerry Lamb (林曉峰), Wong Cho Lam (王祖藍), Louis Yuen (阮兆祥), Elvina Kong (江欣燕), King Kong (金剛), Otto Wong (王志安), and Lan Sai (蘭茜). 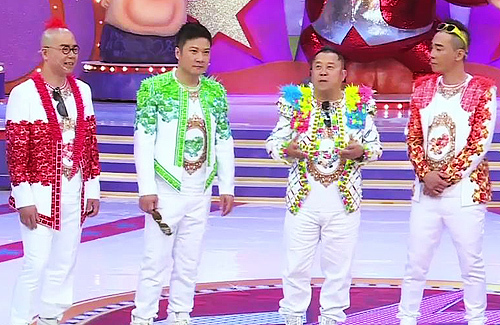 The Super Trio show is one of Hong Kong’s longest-running variety shows in history. Debuting in 1995, Super Trio has had consistent viewership ratings of over 30 points for every series. The ninth series, which aired in 2010, ran for 28 episodes and averaged 32 points. The show’s first few series also broke Hong Kong’s all-time weekend ratings records. The first episode will star guest artists Nancy Sit (薛家燕), Michael Tse (謝天華), Andrew Lam (林敏聰), Diana Pang (彭丹), Natalie Meng (孟瑤), Johnny Tang (鄧兆尊), Carlo Ng (吳家樂), Timmy Hung (洪天明), and Janet Chow (周家蔚). The premiere will also feature an award ceremony held to commemorate the series’ success in the past 18 years. The awards will be given to those artists who have given memorable entertaining performances in the Super Trio games. Some of the awards include Best Action Star (Nancy Wu and Natalis Chan), Best Foreign-language Film (Diana Pang), Best Supporting Actor (Timmy Hung and Carlo Ng), and Best Visual Effects (Natalie Meng). Timmy also performed a kiss with Carlo when they received their award. Eric also expressed his hopes in inviting Andy Lau (劉德華) and Jacky Cheung (張學友) to the show. Currently going through a period of mediocre viewership ratings, Eric was asked if TVB hopes to save its viewership record with Super Trio Maximus. The 60-year-old explained that Super Trio Maximus was already planned months in advance, before TVB experienced a dump in ratings. Super Trio Maximus will premiere on Sunday, May 26, 2013 on TVB Jade. I think they will film more then 13 episodes since TVB is running out of show development. rainbow colored frou-frou costumes is inappropriate for males, much less aging ones. That’s part of super trio’s style. Nothing wrong its a fun game show. this is gonna be epic only because the original hosts are bck; jordan chan n jerry lam, all ones after they left have sucked. The later ones were nowhere as good as the first couple of years. Now only C-stars come to the show and sometimes even more than once. Look at Timmy Hung, for him this show is a full-time job now LOL. And who wants to watch Nancy Sit. That woman is at least 10 years past the expiration date. I agree that part of the problem with the recent 2-3 incarnations of the show is that the celebrities they are inviting are not the front-liners that TVB is actually promoting. I sense they are purposely not having them go on the show to avoid any damage to their image/reputation which is somewhat understandable but ultimately a stupid exercise.